Find your target with world-class engineering and optics built to military-specs in the Steiner M5Xi 3-15x50mm Rifle Scope. 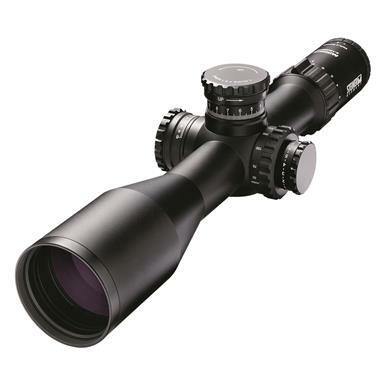 Designed as a medium range scope, the the Steiner M5Xi 3-18x50mm has a patented DuoScale elevation adjustment offering a second-rotation scale that remains hidden until active. Twist the magnification ring and use the 5x zoom to locate targets at longer distances without any fisheye effect or fuzziness at the edge. Aggressive knurling makes adjustments under any conditions easier with positive grip elevation, windage, and illumination knobs along with nonslip diopter and magnification dials. The 34mm aluminum tube provides greater strength and reliability as well as greater elevation and windage adjustments for longer ranges. Multi-coated lenses and brutal testing in the factory ensures your scope operates error-free in crucial moments. The Illuminated MSR reticle has 11 intensity levels (four day and seven night) and standby levels between each for fast return setting.